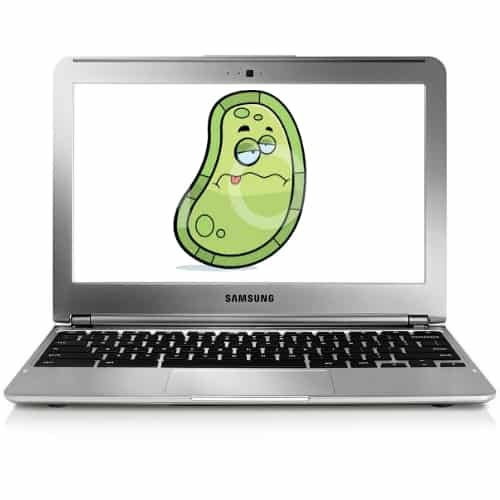 Chromebook Virus and Malware Removal – Can a Chromebook get a virus? Thank you for visiting the Chromebook virus and malware removal page. Very few things in life these days are as scary as getting a virus on your computer. Rest assured however, that it is nearly impossible for a Chromebook to be infected by an actual virus. Chrome OS is one of the most secure (if not THE most secure) operating systems on the market. This is due mostly to the fact that Chrome OS does not allow you to install ANY programs (hard to install a virus when you can’t install anything), but is also due in large part to the operating system’s Verified Boot solution. Google also releases official updates to Chrome OS every 6 weeks (and some unofficial ones in between) that bring new features, and security updates. For more information about Chromebook security, check this out. Here’s a short video that shows you how to protect your Chromebook from Virus’. Now that you’ve taken the necessary precautions, let’s talk about your “virus”. So at this point I think I’ve made it pretty clear that you don’t actually have a virus on your Chromebook, but even so, it is possible for your Chromebook to be affected by malware or malicious extensions, which sometimes feel like a virus. I’ll briefly explain what a Malicious Extension looks like, and what Malware is, then I’ll tell you how to get rid of them. There are many many useful extensions available in the Chrome Web Store. Unfortunately, some of them are just plain crappy. Sometimes it’s crappy right away, sometimes it breaks after an update. It might make your Chromebook operate really slowly, or cause random annoying bugs. It might affect the performance of other extensions. Sometimes the malicious extension doesn’t even originate from your Chromebook. Often times what happens is a user will download and install something on their Windows or Mac machine that quietly adds a malicious extension to your Chrome browser. Then the malicious extension syncs to their Chrome browser on their Chromebook. The reason people often confuse this with a virus, is because the user will usually do a browser reset, or even a Powerwash in an attempt to rid themselves of the “virus” and the problem just keeps coming back. It keeps coming back because it was never removed from the Windows or Mac machine, and it keeps re-syncing the extension from the Windows/Mac machine to the Chromebook every time the Chromebook boots up and connects to the internet. It seems impossible to get rid of. Really, you are getting rid of it when you do the browser reset, it’s just that it keeps coming back once it syncs with your other computer[s]. Sometimes users visit a website that has malware. It locks the browser and usually tries to convince you that in order to continue using your computer, you need to pay money. THIS IS A SCAM. You should never have to pay money to continue using your Chromebook. DO NOT call the number, DO NOT pay the money. This scam is commonly referred to as a “Browser Hijack”. If your Chromebook has acquired a malicious extension, you’re going to want to do three things: Turn extension syncing off in your Chromebook settings; Reset your Chromebook; Fix the problem on your Windows and/or Mac machines. Once you’ve fixed the problem, you can go ahead and turn extension syncing back on if you’d like. Note: Turning extension syncing off prevents the malicious extension from syncing to your Chromebook again. Click Reset. All of your extensions are now disabled. At this point, your problem will most likely have disappeared because you’ve disabled ALL of your extensions on your Chromebook. All the good ones, as well as the one that’s been causing you troubles. Keep in mind the issue still exists on your Windows and/or Mac machine, but more on that later. You can re-enable your extensions one-by-one until the issue returns, which will tell you which extension was causing your issue. Then make sure to remove that extension from Chrome on ALL your devices before going back into settings and turning sync back on. If you’re having a hard time isolating the problem on your Windows machine, this tool might help. Click on the blue “Questions? Contact Us (beta)” button in the bottom left of the window that pops up. Click on the blue “Speak to an Agent” button. During the call, the agent will hear you but not be able to see you. This one is even easier to fix than a malicious extension! For the Samsung Series 5, and Samsung Series 5 550, insert a pin into the tiny hole on the bottom of the device to press the reset button. Now this is important. When your device boots up, and you open Chrome, it’s going to ask if you want to restore Chrome. DO NOT DO THIS. Just click the little X to make that message go away. If you click restore, it’s going to re-open that naughty website that hijacked your browser, and you’re going to be stuck again and have to do another hard reset. The Zeus virus is a windows program and therefore cannot be installed on a Chromebook. You have nothing to fear from the Zeus Virus. If you’re seeing something that claims to be a Zeus virus, it’s just some kind of malware or bad extension. Follow the instructions above on this page. Thank you for this information! I didn’t know about the hard reset for chromebooks. Hi I am trying to remove ”malicious extensions ” I tried to uncheck ”Extensions” in Advanced Settings and I am unable to ( it won’t uncheck). Any ideas as to what’s going on or what I should do next? you click on the drop down above the checks and then choose “check what to sync” and then choose extensions. I got the warning. Now my chromebook won’t even turn on so the suggested fix doesn’t work. It would appear that chromebook is NOT safe from virus. Same here. Caught this virus from facebook. Opened a video and it took over. keys would not work. could not turn power buttonJohn off so I closed it. Now nothing, no power, no start up, just dead. That’s a scam, that’s not Google, DO NOT DO IT. I suddenly heard faint music playing (sounded like a radio) and people talking. My chromebook was on but nothing running on it. Thought it was the neighbour’s, turned the tv off, to my surprise it was coming through the chromebook! I had to plug the earphones in to make sure. I immediately turned it off then back on and it was gone. This has got me spooked as it seemed I was listening to actual people talking with a radio on in the background. Any ideas what this may have been please? Probably an ad in one of your tabs. Thanks for this. I’ve had some kind of bug on my chrome book for the past few days and every time I click a link it opens a click bait web page…… so far your solution seems to have worked…? I have a chromebook model XE303C12 and two nights ago in the middle of the night my btowser started opening up “adult” type sites and gaming stuff for about 4 hours while I slept. ive NEVER looked at any site of that nature and have no idea whats happening. is this malware? and is it fixable? … but that’s why I got a chrome book! So you could install useless anti virus software? when i type for a web pagge. file opens. My HP chromebook runs extremely slow when im yahoo mail……it takes a very long time for mail to open up and semi freezes….is it yahoo or my chrome? Thanks. Care to share how much RAM your Chromebook has? Step 1: Stop using yahoo. Step 2: Continue troubleshooting the problem. Hi I opened a dodgy attachment on an email while on my chromebook. It now says it can’t connect to Wi-Fi ( out of range) am I protected or do I have some kinda virus. I cancelled my internet banking just in case. free.atozmanuals.com this website keeps randomly popping up is there a way to keep it from popping up? Thanks for the help! Greatly appreciated! It was nice of you to do this and help people. I just started using a Chromebook and know nothing about it, quite the change from Windows. Thanks once again for the knowledge. Thanks a lot for sharing this information regarding Chromebooks security. My Chromebook is forcing me to update and give it some sort of permission. What do I do? Hello, I got a cookie which reappears within 5-7 min after being manually deleted. Name: hanstrackr.com. It’s classified as a malware website by various blacklists. What else can I do, short of hard/factory reset? I was sent this link on fb from a friend and clicked it without thinking, I’m not too sure what it is, but is my Chromebook safe from something like this? i was on a mirror site (malware) and i got the notification from chrome, it told me i had to call it in the next 5 min or my chromebook would be disabled. i panicked so i cleared all the history on my chromebook, closed all the tabs, then powerwashed. i think i’m okay now but is there something else i should do?